This is a collection of guided reflections to be used with Daniel Wolpert's book Leading a Life with God: The Practice of Spiritual Leadership. The various prompts and exercises are intended to draw participants into deeper reflection and to assist staff members and other church leaders in exploring and developing their spiritual life, including their relationship with Christ and with each other. 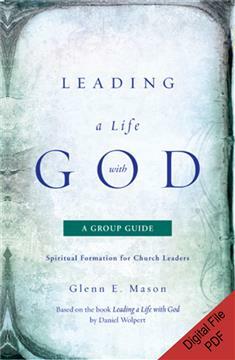 The group guide is intended for small groups or individuals who choose to read Leading a Life with God and begin to practice the forms of praying outlined in the appendix. IMPORTANT NOTES ABOUT APPLICATION REQUIRED: To view Adobe PDF files, you need to download the free Adobe Acrobat Reader DC from Adobe. All support questions related to this application and your computer's configuration will be referred to the developer's website.